Temporal Power’s 50 to 500kW industrial scale modules balance energy generation for hydro producers. 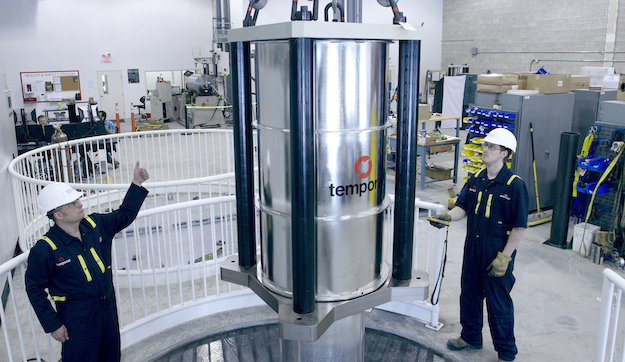 A 500 kW flywheel being lowered into the vault at Temporal Power’s manufacturing facility to undergo testing. Sometimes what seems like bad luck can turn out to be a life-changing catalyst – the thing that sets us on a course we never could have imagined. That’s been the extraordinary experience of Jeff Veltri. 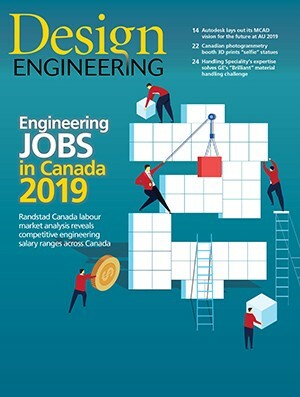 A non-work-related injury in young adulthood ended his five-year stint as a pipe fitter and sent him back to school, into Ryerson University’s mechanical engineering program. He was employed for a while and then started his own firm, working over the next ten years on industrial, biomedical and military projects. The realization of this goal started without Jeff realizing it – in 2008, when the government of Ontario was introducing time-of-use electricity rates. It prompted him to look at how power could be purchased during non-peak billing times and then used whenever it was needed in his home office-shop. In his research, he was drawn to the flywheel. As Veltri mused about flywheel use for his own business, he realized it could be commercialized for grid use. “So, I designed a small prototype and took it to the OPA (Ontario Power Authority) to show it off.” The device had an analog power meter with a disc that spun one way when the machine was charging and the other way when it was discharging, which gave a good visual demonstration. The company did secure the OPA grant, which allowed the tech to be scaled up to bench size, a 1 kW model, and then to what they now offer commercially: a 50kWh, 250kW or 500kW module that can be arrayed to multi-MW scale. Along the way, Sustainable Development Technology Canada and Hydro One provided assistance, and Lockheed Martin verified the design. Carver and Veltri also secured an investment of $500,000 from MaRS Discovery District, and $6 million from a Toronto-based venture fund, allowing the company to move to a facility in Mississauga. They are now at 30,000-sq.-ft. with 24 full-time employees, including eight engineers. In simplest terms, a flywheel is a mechanical battery that stores kinetic energy in a rotating mass. 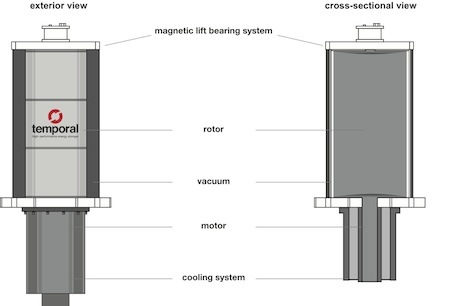 When charging, the motor uses power from the grid to accelerate the rotor to high speeds. Variable frequency drives feed the motor to convert electrical energy to rotational kinetic energy. On discharge, the flywheel slows and its inertial load drives the motor as a generator, adding power back to the grid. Through their ability to efficiently balance energy and control energy frequency (at the standard 60 hz) by rapidly absorbing or generating power, Temporal Power flywheels improve power quality and lower costs. Veltri notes that problems with not being able to regulate grid voltage and frequency quickly helped cause the massive eastern North America power outage in 2003. Temporal Power tech is also obviously very handy in integrating variable power generated from renewable sources like wind into the grid. The size and patented design of these flywheels allows them to hold massive amounts of energy many hundred times greater than conventional (relatively tiny) flywheels. The life cycle of the tech is 20 years with minimal maintenance and full recyclability, Veltri says. The rotating mass is steel, weighing in at 4,000 kg with a top speed of 12,000 rpm. Veltri notes that while carbon fibre has been used in smaller flywheels, it is not feasible in this case as there are few companies who could make such a large rotor with it; carbon fibre is brittle and detecting flaws in it is difficult. The flywheel spins in a vacuum to eliminate wind resistance, and the permanent magnet at the top forms a closed magnetic circuit that lifts the entire mass off the mechanical bearings, allowing them to do radial and axial positioning but under a very light load. The friction losses are therefore very low, less than 1 KW, and the bearings are expected to last a long time. Temporal Power flywheels are being used, so far, by a company called NRStor in their contract with the IESO for frequency stability, and another proposal is in the works. They are also hard at work at a wind energy facility in Tillsonburg for Hydro One. Very interesting technology that can enable massive usage of solar and wind power generation. The problem with solar and wind is that the power generation is not always there, so with flywheel we will accumulate energy during sunny or windy period and use the stored energy when the wind is absent and the sky is dark. 1 Pings/Trackbacks for "Canadian flywheel design putting Mississauga firm on the energy management map"